Our pressure washing services (also know as power washing services) use commercial pressure washing equipment to quickly clean landscape surfaces with high-pressure water. Our team is reliable, experienced, and knows how to tackle tough stains on wood, stone, brick, concrete, and synthetics. Are your online prices guaranteed? No. We make every effort to stand behind our simple online pricing, but there are rare exceptions. If you have an estate, an difficult to access lawn, or a number of difficult obstacles, we reserve the right to revise your estimate. You will never be charged more than you explicitly agree to, and we really do bend over backwards to try to work with our online pricing. We invoice by email, and accept online payments with Visa or Mastercard. We also accept cheques (made out to Gardenzilla), and email money transfers (sent to hello@gardenzilla.ca). Midtown Toronto - The Annex, Cabbagetown, The Danforth, East York, Leaside, Rosedale, South Hill / Casa Loma, Summerhill, and Yorkville. 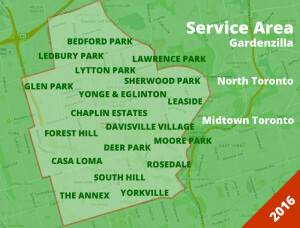 North Toronto - Bedford Park, Caribou Park, Chaplin Estates, Davisville Village, Deer Park, Forest Hill, Lawrence Park, Ledbury Park, Lytton Park, Moore Park, and Yonge & Eglinton. Yes. We carry $2 million in general liability insurance for landscaping and snow removal, and our staff are covered for workplace injuries through the WSIB. We are happy to provide proof of coverage on request.